I have an irrational fear (ok...I have many. But today we're just discussing one). I am terrified of having a child with a peanut (or any nut) allergy. Because...um...would I have to give up peanut butter? I CAN'T DO IT GUYS! I CAN'T! I don't even know what I would feed my childrens. So...this is a very real fear that I think about a lot (because I'm neurotic.) And it's so sad because some kids can't even be NEAR peanuts. And it's like...how can they go out in the world? In Disney World, my brother and I were snacking on some peanuts before Fantasmic! when a mother asked us to please stop eating them because her son (who was in line near us) is allergic. Apparently she had an Epipen just in case but...still. Like....she has to try to make sure no one eats peanuts around her kid. That is rough. So..I'm scared. Anyway. Currently, there's nothing in my life impeding me from my beloved peanut butter. Which is good because...not only is it gosh darn delicious, it's pretty darned healthy (if you use the right kind any way). 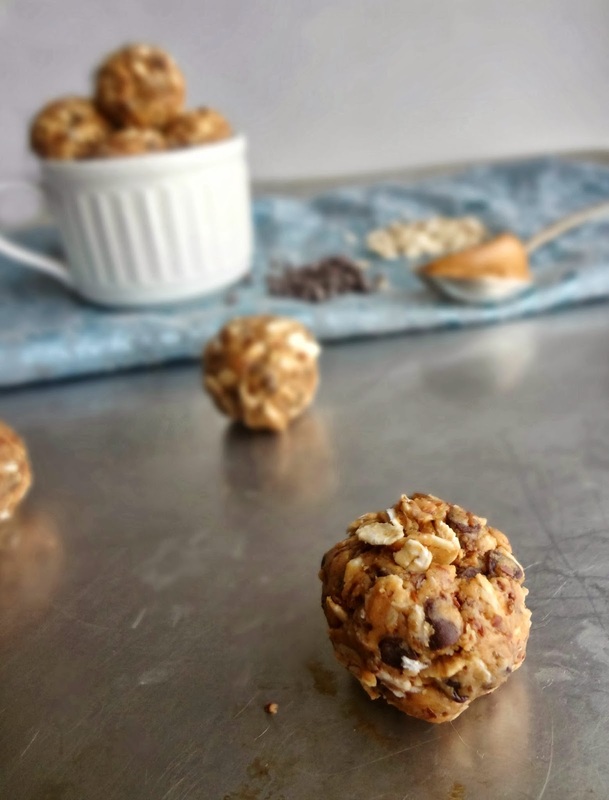 So with the assistance of that magical spread, you can make healthy little treats that taste like cookies or candy. My kind of healthy eating. This recipe is SO. GOOD! 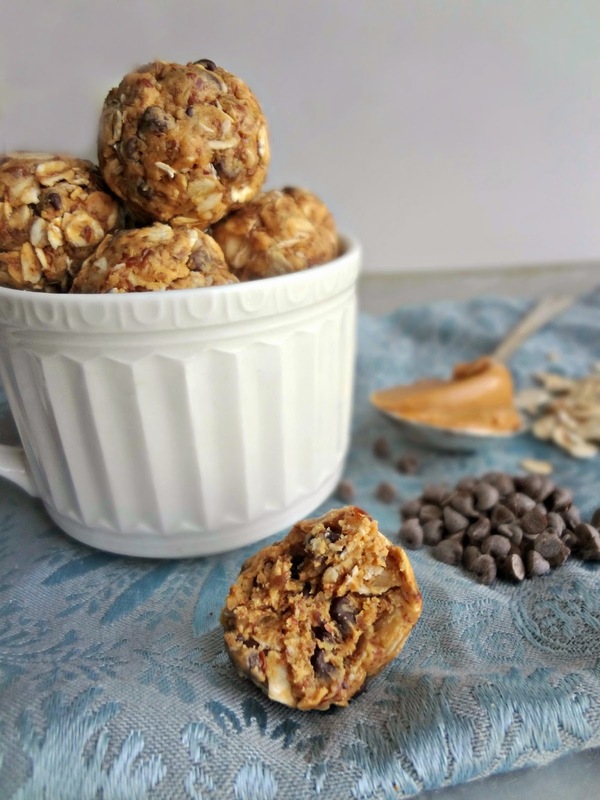 The perfect breakfast or snack: they're bite sized, chewy, full of filling fiberlicious things like oats and flaxseed, and they have tasty chocolate and peanut butter. WIN. They're miraculous little bites. 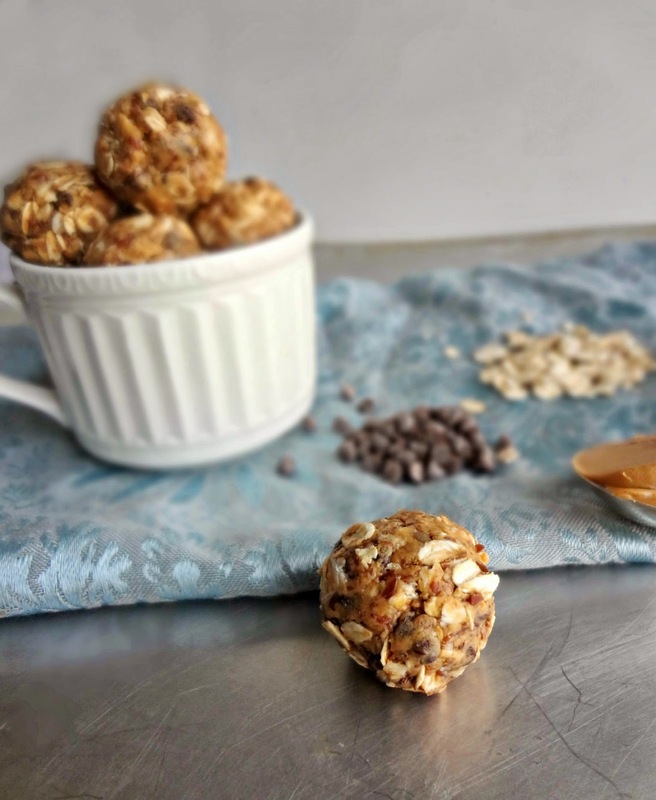 You can take them on the go for an easy breakfast or quick treat. BUT WAIT-there's more! 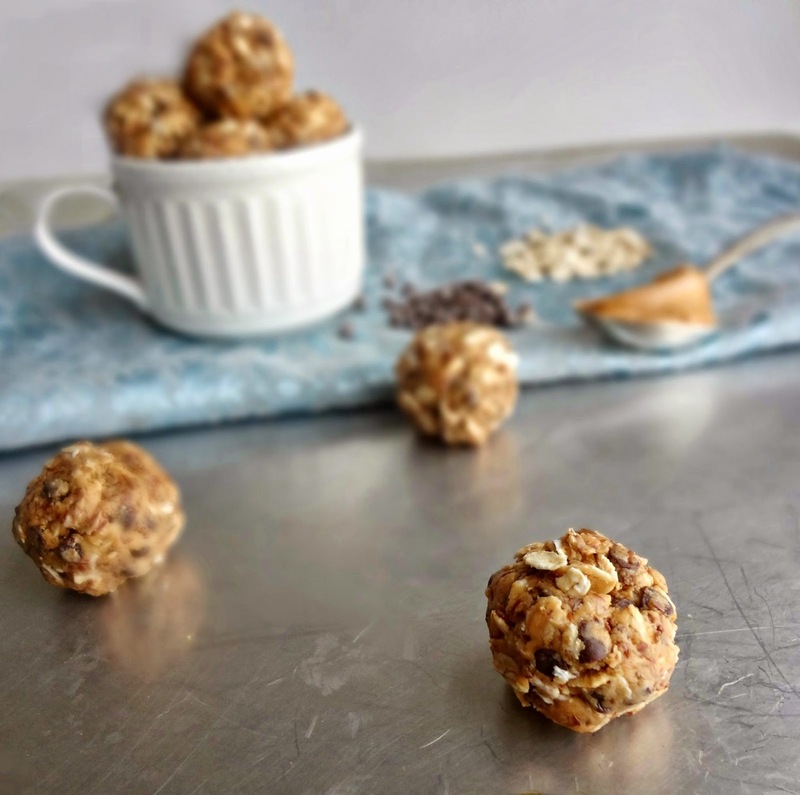 It takes like....10 minutes to make these yummy little balls of goodness. And there's no baking. You just mix em up, roll them into balls, and eat or store them! THE END. It doesn't get any simpler. So. You're smart people. You're probably going to go make these now, yes? 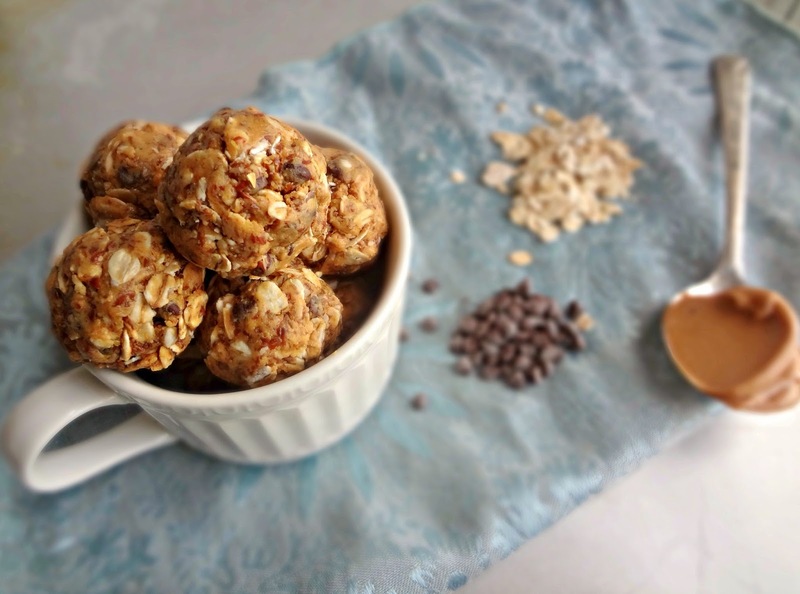 In a medium-large bowl stir together the oats, flaxseed meal, and chocolate chips. Add peanut butter, honey, and vanilla extract. Using a sturdy spoon, spatula, or your hands stir/knead the mixture together until completely incorporated. Will be very thick. Shape dough into tablespoon sized balls. Store in an airtight container in the refrigerator (using wax papers in between layers, if necessary) until ready to eat.